Biography of Early Renaissance Florentine Sculptor & Architect. An important figure in Italian Renaissance Sculpture, the Florentine artist and architect Nanni d'Antonio di Banco was the son of an artist named Antonio. Along with the architect Filippo Brunelleschi (1377-1446), and the sculptors Lorenzo Ghiberti (1378-1455), and Donatello (1386-1466), Nanni di Banco helped to shape the course of the Early Renaissance in Florence, and was an important figure in the transition from International Gothic to Renaissance art, although he has received little critical attention compared to more famous Renaissance sculptors of the period. He is best known for his group statue of the Quattro Santi Coronati (Four Crowned Saints) for the church of Orsanmichele in Florence. There are few if any recorded details of di Banco's upbringing or training in the art of sculpture. In fact, there seems to be some considerable disagreement as to when he was born. Some sources give 1375 as his birthdate, others 1384, and others even give 1390. The fact that he was among Donatello's best disciples and friends suggests he was close in age, and probably no older than the great Donato di Niccolo di Betto Bardi with whom he often sculpted. Much of Nanni di Banco's work was created for one or other of two architectural structures in the city of Florence: the cathedral, and the church of Orsanmichele. Together, these two buildings, formed the principal source of demand for sculpture in the city during the first quarter of the 15th century. Di Banco created some of the most important public works of early Renaissance art, notably his statue of St Phillip and the statues of the Quattro Santi Coronati (Four Crowned Saints) group for Orsanmichele (1410-15) - the latter portraying the Four Crowned Martyrs and greatly influenced by the classical tradition - and the Assumption of the Virgin for the Porta della Mandorla of the cathedral of Florence. Di Banco's sculptures have a Gothic elegance, but also reveal the influence of the antique; his masterpiece, the Quattro Santi Coronati for example features grave and dignified figures modelled on statues of Roman senators. Interestingly, because this and other major sculptures by D Banco have few authenticated dates, it is not clear whether he was ahead of Donatello in his use of classical models. Although Giorgio Vasari (1511-74), the principal biographer and historian of the Italian Renaissance, included a biography of Nanni di Banco in his "Lives of the Most Excellent Painters, Sculptors, and Architects" (Le vite de' piu eccellenti architetti, pittori, et scultori italiani, 1550), Nanni has been seen as a traditional stonecarver who succeeded as an imitator of classical statuary, without having any significant sense of imagination. A recent study by Mary Bergstein has countered this by referencing Di Banco's leadership role in the stonemason's guild (note: The Four Crowned Martyrs of the Quattro Santi Coronati were the patron saints of the stonemasons' guild), and by highlighting the gravitas of character and physical presence of his major works. It's worth comparing Nanni with the more progressive Sienese master Jacopo della Quercia (c.1374-1438). 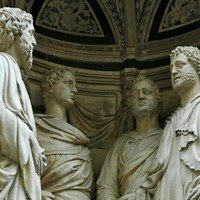 To learn how to judge artists like the Florentine Renaissance sculptor Nanni di Banco, see: How to Appreciate Sculpture. As an architect, Nanni di Banco helped to design the winning model for the Duomo of the Santa Maria del Fiore Cathedral in Florence (1418), under the leadership of Filippo Brunelleschi, where he also made the statue of St Luke, which was completed in 1408.